I’ve been considering my quilting goals for 2008 and I think that I have a reasonable plan in mind. Manipulating Fabric Monthly- As I mentioned in an earlier post. 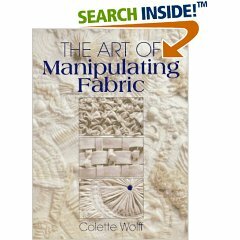 I received the book Manipulating Fabric for Christmas. I want to learn one technique per month from that book. I will do a few mock-ups and then do one finished piece featuring that technique each month. The size of the finished pieces will be 18″ square. I don’t want them to get too big and too involved but larger will probably be easier with most of the techniques. River Walk Series- I’ve been wanting to work on this for some time. 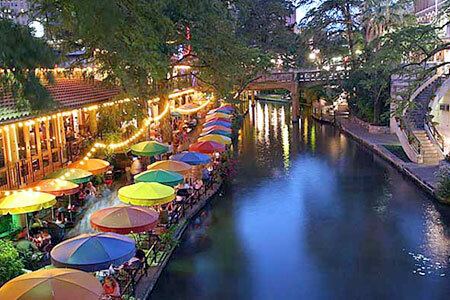 The River Walk here in San Antonio is a treasure chest of visual inspiration. I will develop a series of art quilts using the art deco architecture, the trees and flowers, the people and the festive feeling of the River Walk as inspiration. These pieces would be finished art quilts, 40″x 40″ or larger. I’d like to finish 2 this year but I think realistically I will only get 1 done. But this will be a series that I would carry on into 2009. Dressed for Dinner- This is a class that I’d like to take at the LQS. The class will meet once per month. My goal for this class is to learn a machine appliqué technique that I am comfortable with. I always avoid appliqué because I’m not comfortable with my skill level with it. Also I’ll be taking it with a friend so it will also serve as Girls Night Out, or rather Girls Saturday Morning Out!! Guild quilts- I will quilt one quilt per month for my guild’s Community Services program. These quilts go to local organizations, mostly the children’s advocacy center. Customer quilts- I will quilt 3 customer quilts per month. I enjoy helping others finish up their quilts and am amazed at the variety of quilts that comes across my quilting table. Leftovers- There are also the works in progress that are left over from 2007; Antique Stars, Robbing Peter to Pay Paul, Autumn Jewels and Goose Chase. I will finish those up in the first 6 months of 2008. 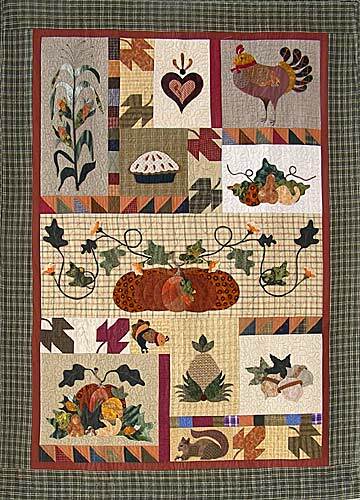 Best wishes to you and your family and happy quilting in 2008!! Your River Walk Series sounds exciting. I hope you have an inspired new year! So that is basically one quilt a week. . . what are you going to do with the other 5 days? I am laughing at Debra’s comment! I was thinking the same thing…sounds like a lot of fun ahead, can’t wait to see the River Walk series. You will certainly be busy, girl! I love the River Walk idea. The colors in that photo are certainly inspiring, even without seeing any of the detail. Good luck on that. Great list. I love the idea of the River Walk series. Yep, 2008’s going to be a busy year! My husband and I went to San Antonio on our sort-of honeymoon. (We had just got married in 1994 and he had to go to S.A. for work so I went with him. We called it our honeymoon.) I loved the Riverwalk. And we ate at a restaurant called La Tiera, or something like that. It was wonderful. Fantastic food, mariachi band, a beautiful singer. I hope to go back to S.A. someday. I look forward to seeing your Riverwalk quilts. Well that list should keep you busy! Looking forward to seeing the results. I love the River Walk photo too – can’t wait to see the quilts. I visited a couple years ago and had a great time wandering while Keith was working. I posted some photos on my blog at the time.